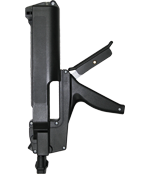 Hand-operated gun for the processing of 2-component PU door frame foam OTTOPUR Turbo 2 x 105 ml. U-shaped top loader made from fibreglass-reinforced nylon. Single-handed lock release and balanced handle. Transmission ratio 26 : 1 No spare parts service. Hand-operated gun for the processing of 2-component side-by-side cartridges 490 ml (Sulzer F system). U-shaped top loader made from fibreglass-reinforced nylon. Single-handed lock release thanks to balanced handle. Transmission ratio 25 : 1For high-viscose 2-component hybrids and 2-component silicones. Hand-operated gun with a steel tub for processing double cartridges 2 x 190 ml Transport rod, catch and reverse lock made from tempered steel. Professional hand-operated gun for high demands. Transmission ratio 20 : 1 with ball bearing transport mechanism. For low, medium through to high-viscose 2-component hybrids and 2-component polyurethanes. Hand-operated gun with a steel tub for processing double cartridges 2 x 310 ml (also suitable for 2 x 190 ml double cartridges) Transport rod, catch and reverse lock made from tempered steel. Professional hand-operated gun for high demands. Transmission ratio 20: 1 with ball bearing transport mechanism. For low, medium through to high-viscose 2-component hybrids and 2-component polyurethanes. Heavy-duty hand-operated gun made from highly impact-resistant plastic, very lightweight. With closer for sliding sleeve and smooth driving rod for 290/300/310 ml cartridges. Transmission ratio approx. 18 : 1 For medium to high-viscose acrylates, hybrids, polyurethanes and silicones. Hand-operated gun with aluminium cylinder. For foil bags up to 400 ml and 290/300/310 ml cartridges. For medium to high-viscose acrylates, hybrids, polyurethanes and silicones. Professional quality. Ladder hook available separately. Transmission ratio 18 : 1 No spare parts service.